According to the UN Refugee Agency (UNHCR), Kenya is host to approximately 500,000 refugees and asylum seekers, the majority of whom are from Somalia. Other countries of origin include South Sudan, the Democratic Republic of Congo (DRC), Burundi, Uganda, Yemen, Syria, Nigeria, Ivory Coast, Central Africa Republic, Eritrea and Ethiopia. As the overall population of refugees and asylum seekers in Kenya countrywide has decreased, mainly due to the voluntary repatriation of Somalis, the urban refugee population in Nairobi increased by 25% between 2014 and 2016 to nearly 63,278 registered refugees. HIAS serves between 500 and 900 beneficiaries each month. In addition to its three field offices in Kayole, Kawangware and Eastleigh neighborhoods, HIAS also conducts weekly outreach clinics in Rongai, Kasarani and Kitengela to serve more vulnerable refugees and bring services closer to the community. HIAS is well-known for its specialized programming for LGBTI refugees and has been a trusted service provider for this community for almost a decade. 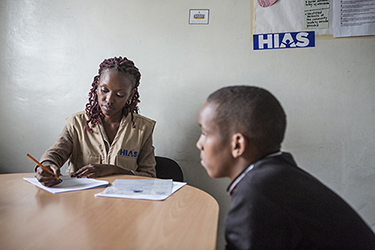 Working with urban refugees and asylum seekers in Kenya since 2002, HIAS has gained technical expertise and experience in comprehensive needs assessment. HIAS Kenya focuses on the most at-risk refugee populations and cutting-edge service provision, integrating best practices based on internationals standards with a focus on community-based protection and empowerment. HIAS collaborates with refugee beneficiary populations to develop culturally appropriate interventions, activities and community-based support systems that improve the psychological and social well-being of refugees. HIAS’ caseload encompasses the most vulnerable refugees and other persons with specific needs, most of whom are survivors of gender-based violence (SGBV) with multiple vulnerabilities. Many of these refugees are also experiencing psychological distress as a result of circumstances faced in the country of asylum as well as the effect of negative experiences from the country of origin. The majority are unable to meet their basic needs. For clients who benefit from psychosocial services, HIAS provides those who have been assessed to be the most vulnerable with limited direct assistance to cover certain expenses. Additionally, support for survivors of SGBV includes mechanisms for communal healing that view suffering collectively and encourage recovery and reintegration of survivors into the community. HIAS advocates for favorable policies and legislation for refugees. HIAS works to create partnerships to protect the rights of refugees and also promotes community-based protection by educating refugees and empowering them to speak up for their rights. Additionally, HIAS provides a safe and dignified housing facility for the most at-risk refugees. HIAS also engages in stakeholder coordination and capacity-building activities to advance refugee protection at the policy level. Partners include refugee community leaders, refugee organizations, civil society groups, government agencies, the UN refugee agency (UNHCR), hospitals, schools, universities, lawyers and other professionals. This coordination and capacity building allows HIAS to refer clients to needed services and trainings; build capacity in the sector on refugee rights; develop joint initiatives to advance policy change to increase refugee protection; and, as appropriate, support strategic litigation by other non-governmental organizations (NGOs) to advance refugee rights. As part of its legal protection work, HIAS also partners with local NGOs, resettlement country governments and UNHCR to ensure the integrity of the refugee resettlement system and to advocate and promote durable solutions – local integration, safe and voluntary repatriation and resettlement, where critical. 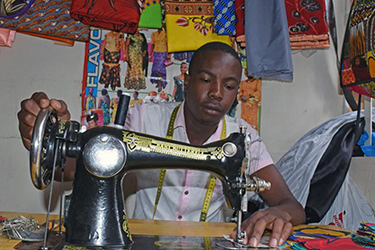 The livelihood program seeks to enhance opportunities for self-reliance and skills-building for refugees, promote and support business enterprise development for refugees and advocate for a business-friendly environment for refugees. The program works closely with refugee communities and their leadership in development of program design, evaluation and follow through. HIAS builds the organizational, technical, and operating capacity of local community-based organizational partners to provide, services that benefit both vulnerable refugees and host communities. This is done through skills training, financial literacy and issuing of business startup kits. HIAS’s services are free. If someone tries to charge you for services claiming they represent HIAS, please report it at our confidential email address: ethics@hias.org. HIAS has a zero-tolerance policy on fraud and corruption.